The Columbus chapter of the National Association of Women Business Owners has partnered up with Sage Sustainable Electronics to bring an event to campus Monday where students can donate used electronic devices, network and learn more about the digital inequity that female business owners experience. 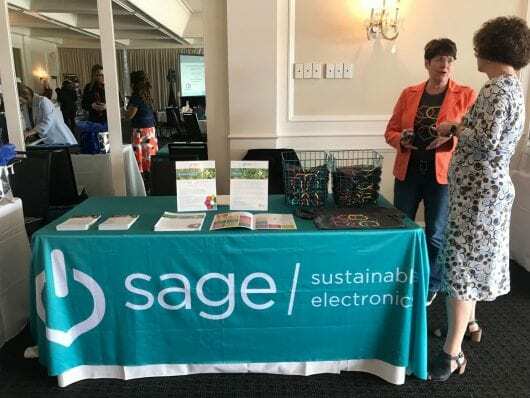 Sage Sustainable Electronics is a technology recycling and refurbishment company, while NAWBO Columbus chapter is an organization committed to empowering female business owners in Central Ohio. After hearing about the prospective collaboration between Sage and NAWBO as an intern, Lila Appaya, a fourth-year in psychology and criminology, took over as the project coordinator upon realizing it aligned with her capstone project. She said she also realized NAWBO hadn’t tapped into the Ohio State female population and that college students tend to have used devices that they wouldn’t have otherwise thought about donating. As project coordinator, she connected the dots between the two and organized the first collection drive at Ohio State. Jill Vaske, the president and founder of Sage, said they are aiming to create unrestricted funds for NAWBO by refurbishing collected devices and donating them to NAWBO to be sold to other businesses at a discounted price. As a business owner, Vaske said she sees a lot of synergy between Sage and helping other women succeed and prosper in businesses. Considering the 60,000 women-owned business in the Central Ohio area, the partnership felt like a great way to support women in business, Vaske said. “Anyone can come, but we’re targeting it towards the female students at OSU because I feel like it’s really important for women to empower women,” Appaya said. NAWBO mentors will be present at the event to network and talk about navigating challenges women face in the workfield and to answer any specific questions, such as how to ask for a promotion, Appaya said. Besides networking, mentorship opportunities will be available as well, she said. “Students will also have the opportunity to sign up for NAWBO if they want a membership. There’s a discounted student price of $10,” she said. The event will be held at the Ohio Union in Great Hall Meeting Room 2 from 2-5 p.m. Monday.